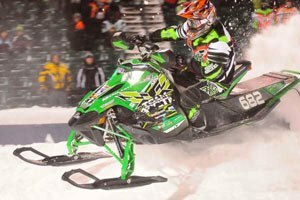 Team Arctic put on a clinic at the ISOC National snocross in Fargo, ND, winning eight of 12 classes. Brian Nelson and I put 55 miles on two of his three '79 Arctic Cat el tigre Cross-Country sleds, pounding the ditches near his shop in Spicer, Minn.
Two things: Brian still FLIES, and so does the '79 CC tiger. I wish I had video of 15-minute portion of this ride, during which we were seriously raging at race-pace. Alas... the best moments ALWAYS happen when the camera can't be rolling. Check out this cool video of the last stage of the 2010 Rally-Reids Baja race in the Ukraine. Another Team Arctic racing legend has been busy building a vintage el tigre for the upcoming USCC I-500 cross-country. Click to see the beginnings of Aaron Scheele's sled, and what's going on inside his shop. I was at Arctic Cat a few days ago, doing some research and gathering info for some stories I'm working on. Here's a few pix that I can share with you. Which 800 is King, Which is Jester? 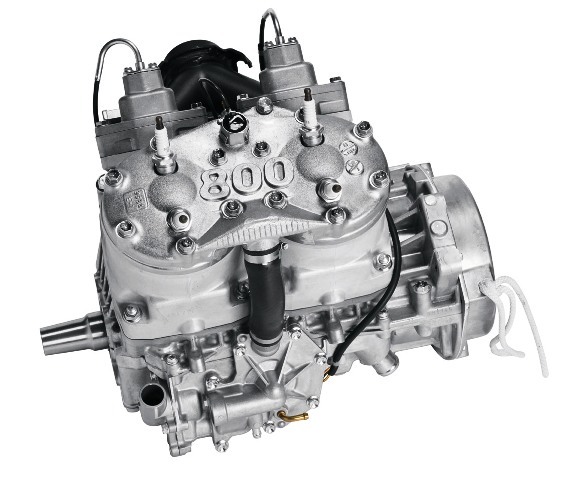 DynoTech Research tested the three 2010 800-class engines at their independent facility. Click to see who's king, and who's Jester. 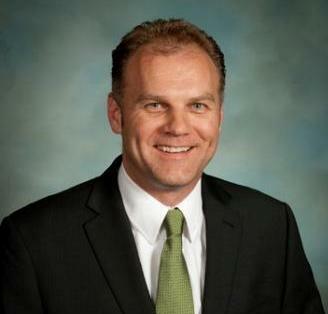 The ol’ black magic has been stirred once again inside of Jim Dimmerman. The front arm of this rear suspension is a nice copy of the Arctic Cat Slide Action design. 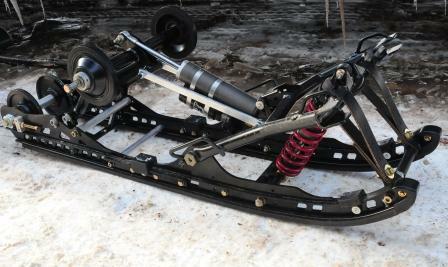 What makes this even more interesting, is that this suspension is from the new 2011 Ski-Doo race sled. Click to read a little bit more. 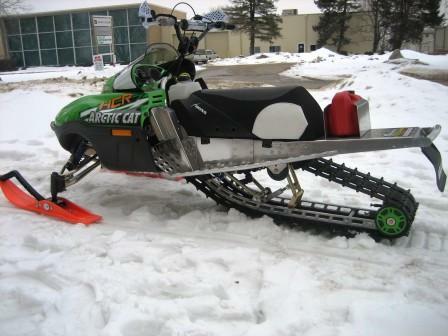 Check out this video of Snow Goer magazine editor Andy Swanson, who spent a day assembling a 2011 Arctic Cat Sno Pro 500 at the factory in Thief River Falls. Click to check out some Team Arctic pix from the ISOC Duluth Spirit National. There is NOTHING like the sight and sound of Pro Open sleds ripping up the starting line at the snocross season opener in Duluth, Minn. Here are a few short segments of practice, and the real thing, including one of Dan Ebert, a couple of Johan Lidman, a couple heat races and the Pro Open final. After a few weeks testing the new Hibbert-brand merchandise, the Sandberg family has a few choice words for anyone considering this stuff. During the course of a year, A lot of photos get delivered to my palatial office via old pack mules, but I don't always have a full story to accompany them. So, I'm officially instituting a RANDOM PHOTOS OF THE MONTH series, beginning now. Here's a SnowTrax TV video about swapping in FOX Float EVOL ski shocks (and remote reservoir/clicker Zero X shocks on the skidframe) on their Arctic Cat Sno Pro 500. Anyone here put EVOLS on their Sno Pro? I'd like to hear your thoughts. So what's been happening with Brian Nelson's three-sled Vintage I-500 project since I posted THIS FIRST STORY? A lot. With a bunch more work needed. Click to see the progress. Tucker Hibbert Preseason Testing from Team 68 on Vimeo. More video from Tucker Hibbert's preseason test trip to Colorado. Watch it here, or watch if from Tucker's BLOG HERE, where you can also read his musings on a variety of stuff. 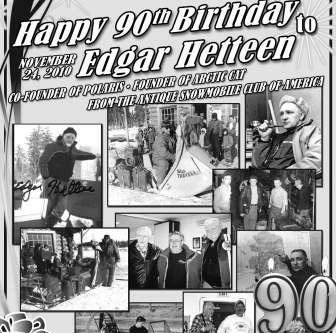 Wish Edgar Hetteen a Happy-90th! Arctic Cat and Polaris founder, Edgar Hetteen, will turn 90 years old on Nov. 24. Click to see how to send him a birthday wish. Tucker Hibbert gets ready for the 2011 snocross season in several ways, including giving his dad, Kirk, grief about the snow that fell during the fall test/practice trip in the Rockies.